Wisconsin state policy allows students to earn dual credit for academic or CTE postsecondary courses taken at their high school or a postsecondary institution. It is not clear whether public postsecondary institutions in the state are required to accept dual-enrollment credits (ECS, 2015). The National Council of La Raza has partnered with an institution of higher education to provide one Early College High School program as part of the Early College High School Initiative (ECHSI; Jobs for the Future, n.d.). Wisconsin has adopted the National Career Clusters Framework and is implementing all 16 Career Clusters. 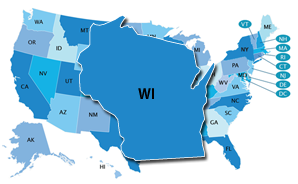 In Wisconsin, the Individual Learning Plan (ILP) provides students the opportunity to engage in the process of evaluating their interests, skills, and values; investigate the inter-relationship of educational achievement, life goals, career planning, training and placement; evaluate the present job market and analyze predictions of future trends at local, regional, state, national and global levels; propose career options and set goals; and create an ILP to reach those goals. Wisconsin's ILP is mandated by the state. It includes all students in Grades 8–12. State statute recommends but does not require that school boards grant a high school diploma only when students earn an additional 8.5 credits from among career and technical education, foreign languages, fine arts, and other courses. Students are required to earn 0.5 credits in a health course in Grades 7–12. Wisconsin’s state-specific Early Warning System is called the Dropout Early Warning System (DEWS). Early Warning System data are reported at the student, school, district, and state levels. Access is granted by the application administrator to whom eligible potential users submit an application.